Do get in touch if you have any query or request you think we can help with, or if there is any information about St. Mary's Church which you would like to have. You can contact us by email, phone or by post and there is a contact form below as well which you can use very easily. We are also always very pleased to receive any feedback on our website. 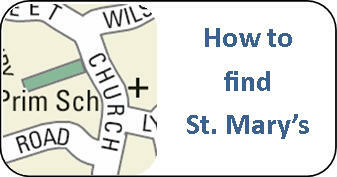 The parish office operates on a part time basis between 9am to 1pm on Tuesday, Wednesday and Friday. You can always leave a phone message outside these hours.